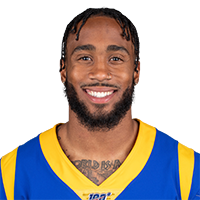 Published: Jan. 20, 2019 at 08:43 p.m.
Los Angeles Rams safety John Johnson hauls in an epic interception of New Orleans Saints quarterback Drew Brees late. Published: Jan. 12, 2019 at 10:47 p.m. The Los Angeles Rams stonewall Dallas Cowboys running back Ezekiel Elliott on fourth-and-short. Published: Dec. 30, 2018 at 05:07 p.m. Published: Dec. 9, 2018 at 10:43 p.m.